Consistently showing growth and the ability to adapt/evolve with each new album, Allegaeon have earned the title of being one of America’s strongest melodic death metal bands. It has taken a lot of work, and the band has seen numerous members come and go, but at the point of their now fifth album it seems that they are finally getting some attraction outside of the extreme metal circles. Given what Apoptosis does for the band, it couldn’t have come at a better time. 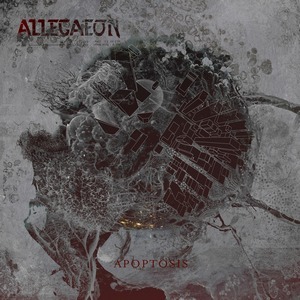 While undoubtedly “Allegaeon” in tone, Apoptosis boasts some delightful twists and turns within their formula. Compared to the last two releases, there’s less of an emphasis on the ‘epic’ atmosphere and synth-backing. While it could have proved a disappointment, there’s a real weight to the material (including some effectively prominent bass work from new member Brandon Michael) and there’s so many delectable things going on at any given moment that it may have been too much if it was added in at the same level. Where Proponent for Sentience was more melodic in tone, Apoptosis is more aggressive and in your face. “Exothermic Chemical Combustion” and “Metaphobia” are some of the most frenetic tracks the band has put out in recent memory, while other cuts like “Interphase/Meoisis” and “Stellar Tidal Disruption” shine with what Allegaeon has always brought forth – brutal yet catchy riffs by the metric ton. Some brief forays into groove and near-slam territory only serve to enhance the experience. As far as riff collections go, this one may in fact be their most effective batch yet, as songs bounce from one moment that you’d wish would last just a few seconds more only to experience the same sensation after the next riff hits and pulls things forward. Perhaps the best example of this is the already released “Extremophiles (B),” which features a driving tempo and riffs that switch things up from fevered blasts and near brutal death metal pounding to fist-in-the-air melodies that tickle the inner ear. The contrast from a sullen clean vocal moment to visceral, sledgehammering riffs and growls in the track’s later half still gives this scribe goosebumps after a solid two dozen listens. These contrasts show up regularly in the album, with the aforementioned aggression coming head to head with some standout melodies. “Tsunami and Submergence” tastefully employs Riley McShane’s clean vocals and a darkly melodic undercurrent yet keeps a straight-ahead attack at points, keeping a yin/yang approach without feeling clichéd or overused. The same could be said for the monstrous title track that closes the album, which veers in several directions – be they a gradual building introduction, thrusting into near black metal riffing, burly death metal attacks, or sweeping guitar-driven melodies, it all ends up creating a final, lasting vision more effective than the sum of its parts. One of those collective sum of experiences where everyone is bringing their best to the table, it would be lengthy to dissect and drill down what each of Allegaeon’s members contribute but suffice to say, the band shines brightest as a whole. Everything is firing on all cylinders, making Apoptosis an experience that fans of extreme music should treasure. Decidedly brutal, but accessible due to the brightly melodic solos/leads and addictive riffs (and vocals), this has everything you could want from Allegaeon.